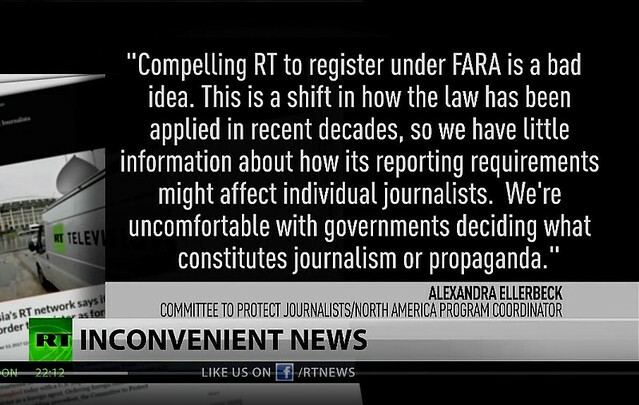 RT America was forced to register as a foreign agent in the US on Monday, a demand that has been criticized as a direct violation of the First Amendment’s protections for free speech and press. Former Green Party vice presidential candidate Ajamu Baraka is one of those speaking out against the move. He speaks with RT America’s Anya Parampil about why RT is facing such unprecedented pressure from the US government. This entry was posted in All Posts News Politics and-or Videos, Anti-war, Capitalism, Imperialism, Media, Propaganda and tagged Ajamu Baraka, Censorship, Chris Hedges, First Amendment, Inequality, New-McCarthyism, RT America, Russia Today, Same As It Ever Was. Bookmark the permalink. Updated: added another video report on this issue with Ajamu Baraka, Green Party VP candidate. In the Land of the Free, people must be protected from free speech, in case it’s really a covert, cryptic message disguised as the oracular utterance of fiendish architects of disruption, cunningly insinuated by the fakers-in-chief at the Kremlin. This state of affairs is simply crazy, especially given the ambiguity of the US establishment these days. Even more so, therefore definitely mad ~ when we consider just how conservative Vladimir Putin actually is! After all, he’s not even a communist. They only speak Mandarin these days. My theory is that this is a gigantic precipitous flashback to the Great Schism of a thousand years ago ~ one of those epoch changing confusions that nobody really understands or ever will, because it was entirely due to cultural differences over speculative metaphysical hypotheticals, like the ‘authentic’ meaning of the trinity, or unleavened eucharistic bread, and the jurisdictional relevance of ‘universal’ papal authority versus the parochialism of the pentarchy and so on. It is as if today’s Loop Quantum Gravity devotees were to foment an irreconcilable dispute with the Cosmological Constant adherents, and trigger an infinitely unbreachable & paradoxical seismic singularity within the virtual core of the Large Hadron Collider….etc. It’s absolutely ridiculous. Thanks, David for your commentary. Updated: added another video report on this issue. What we are witnessing in the United States is chilling. The US ruling class is consciously reviving McCarthyism as part of a literal Cold War 2.0 operation to censor journalists and bloggers like ourselves. The psychiatric inquiry as to whether or not many US figures actually believe the nonsense of Russian hacking is a valid one: for a while now, US empire has been unable to resolve its crisis of decline. This is clearly engendering insanity within an elite whose sheer opulence has engendered a dangerous estrangement from reality. Watch Nato encircle Russia with war games, and ask yourself how many Americans even remember what the Cuban Missile Crisis was. Indeed, it is chilling to watch. Thanks, WeatherEye. I wonder if we could get lots of people wearing “RT” tee shirts, as a counter-move. Or perhaps, more importantly, donate some money to some of the independent media (such as Truthdig, which Hedges works for). Why only resort to money as a fix? My suggestion is to visit independent media websites/blogs, and watch RT and RT America either on their website or on their Youtube channels. Doesn’t cost a thing to do that. Well, certainly watch them. But if you stop there, that’s like thinking revolutionary thoughts — it doesn’t accomplish much. Encourage other people to watch them too. Tell other people what you saw there. That is exactly what I do here on Dandelion Salad almost every day. The links to the Youtube channels are on every post for readers to visit their channel(s) for more videos to watch. Yes, and you do it very well. Thanks for all you are doing, and keep up the good work. Thank you, Lefty. I wasn’t looking for a compliment, though. My point is that any of us could do the same thing. Sharing articles and videos from RT and RT America, and other independent media websites. And of course, I always appreciate the shares on FB and other social media sites for the Dandelion Salad posts. “… any of us could do the same thing.” You’re being too modest, Lo. We all have different sills and gifts. You have developed some skill in finding and choosing the articles that you showcase. To do that, you had to educate yourself, in ways that took both aptitude and effort. You can deny credit for the aptitude if you like — perhaps that was given to you, unearned; you can call yourself a channel for it. Developing the aptitude into skill took effort, and the opportunity to make that effort. Perhaps the opportunity (e.g., time) was given to you too. But still, the effort came from you. Thank you again, Lefty. I absolutely love the St. Francis quote! All credit for the articles is due to the writers who send me their work freely to be published as I cannot write.